So without further preamble, here are some of the most adorable baby shower gift ideas ever! Is mom-to-be a dancer by any chance? If so, she might dream of her baby becoming a little ballerina! 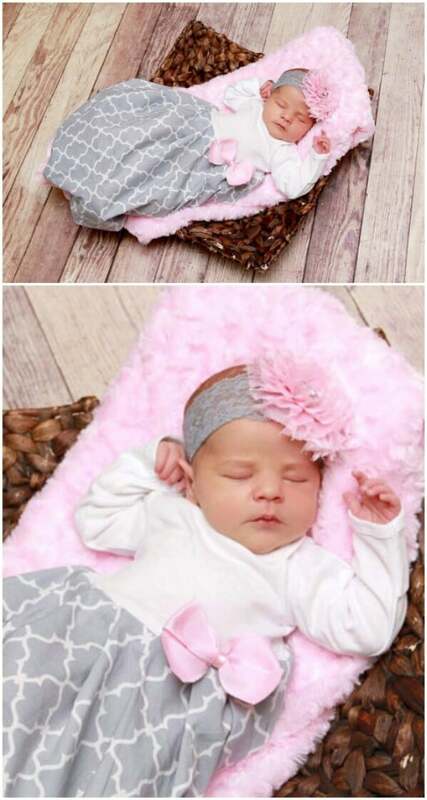 These leg warmers are the perfect gift for any little ballerina-to-be, featuring cute crisscrossing patterns in pink and adorable little bows in the back. They can be worn all by themselves or they can be fitted over other leggings. Naturally they look extra adorable if they are paired with a tiny tutu! Newborn babies love to be swaddled in a nice comfy warm cloth—and no solution for swaddling can compete with this adorable baby cocoon and cap for sheer cuteness! This is a handmade item which you can purchase on Etsy. You could also try making something similar yourself. Personally I love the idea of adding stuffing and sewing the top closed after baby outgrows the cocoon. Then it would become a special plush companion for life! If you’re looking for more baby projects check out this post. Sometimes the presentation of a gift can give it the extra creative flair it needs to be unique! In this video, you can see a lovely idea for presenting baby bibs and attire in the form of a beautiful bouquet! Similar to the idea above, this video shows you how you can use receiving blankets and a few other simple ideas to create little “milkshakes” and “sundaes” which actually look quite realistic! 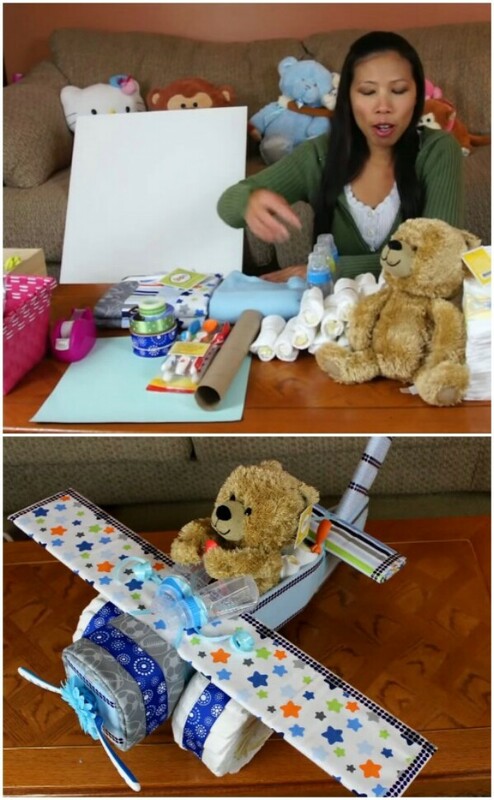 What a sweet idea—so much more fun than just giving mom-to-be a box with receiving blankets inside, wouldn’t you say? If you are going to be showering mom-to-be with a lot of small gifts like toys, mittens, shoes, hats, and assorted baby products, one fun idea is to create a “diaper wreath” combining all of the supplies. This would be fun as an individual gift, but it would also be a great idea for a group gift. Have the person organizing the baby shower hang it up in the room before everyone arrives. What a wonderful surprise! Find out how it’s done in the tutorial below. Diapers … they are one of the most necessary baby supplies ever, and there is no mom on earth who wouldn’t be grateful to get a ton of them at her baby shower. But let’s face it—they are also super boring. How can you make a dull gift exciting? 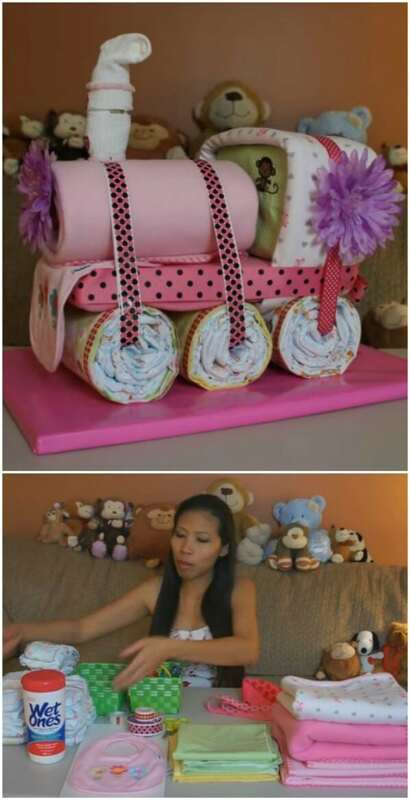 Make a “diaper cake!” There has never been a cuter way to bestow the gift of diapers! Planning on gifting onesies to the expectant mother? If so, you probably realize that half a dozen other people at the party are likely to gift onesies as well. How can you make your gift stand out? 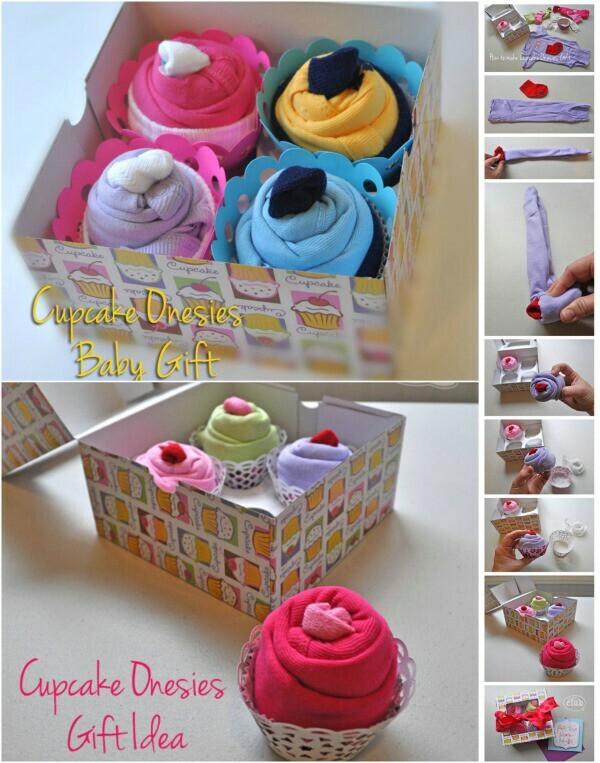 Instead of just folding the onesies into a box, shape them into little “cupcakes” instead! 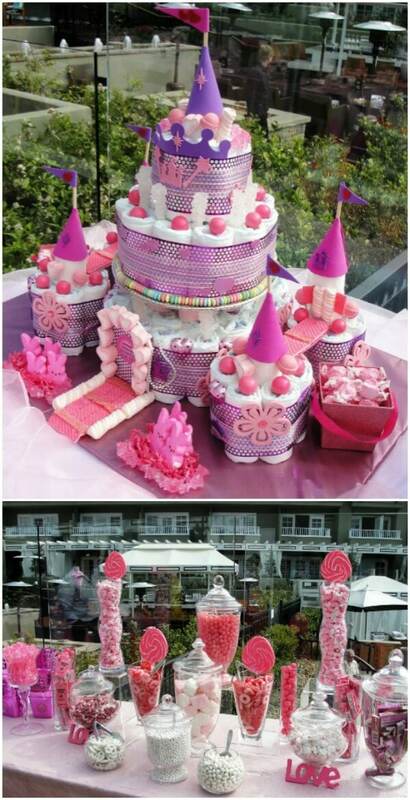 If you loved the idea for making a diaper cake, you will be even more thrilled by this simple variation! The process for making it is much the same, but instead of stacking the layers up like a cake, you instead connect them into the shape of a teddy bear, complete with cute little eyes and a nose. While a lot of the ideas above are creative, here is one that is truly unique. Check out these awesome photography props! They give the expecting parents a fun, quirky, creative way to document their child growing up. 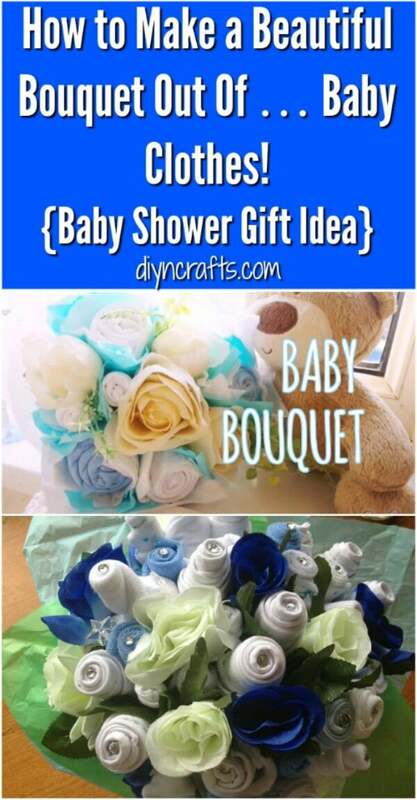 This would make an amazing baby shower gift! 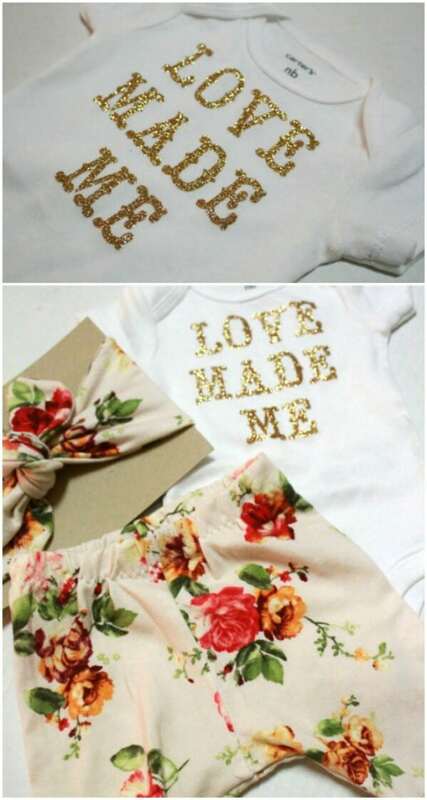 Check out this adorable little onesie with the words, “Love Made Me” in glitter. This is a handmade item which you can buy on Etsy. The shop has a lot of other cute baby attire too. Any one of these would make a great gift—or serve as inspiration to create your own custom onesie with a cute message! For those not in the know with baby lingo, a “layette” is a full set of baby clothes, sometimes also including linens and toiletries. Here you see a gorgeous handmade layette gown which you can buy on Etsy. This layette would be absolutely perfect for photos of the new baby. 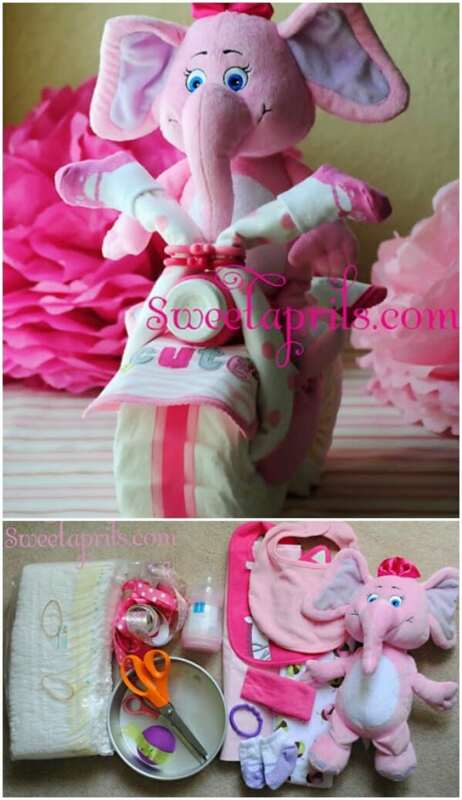 If you are handy with sewing projects, it might also give you some ideas for making a custom layette set yourself! Here you see a handmade snake pillow. 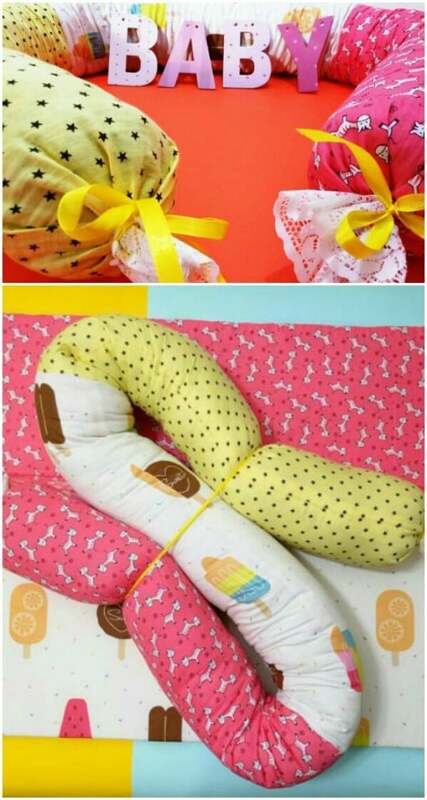 Snake pillows aren’t just cute and cozy—they are actually designed to help keep baby safe! They can provide extra protection in the crib or define the boundaries of a play area outside of the crib. And of course the pillow itself can serve as a soft toy. Buy this snake pillow on Etsy or create your own. While I love this pillow just as it is, I think it’d be even more genius to make one which actually doubled as a plush snake! This is similar to the idea of creating a cake, sundae or cupcake out of baby supplies. Here we see baby shower sandwiches! I think these are amazingly artistic and really quite convincing, and a wonderful way to showcase a lot of bright, fun colors. Planning on gifting the mom-to-be with a lot of baby socks? 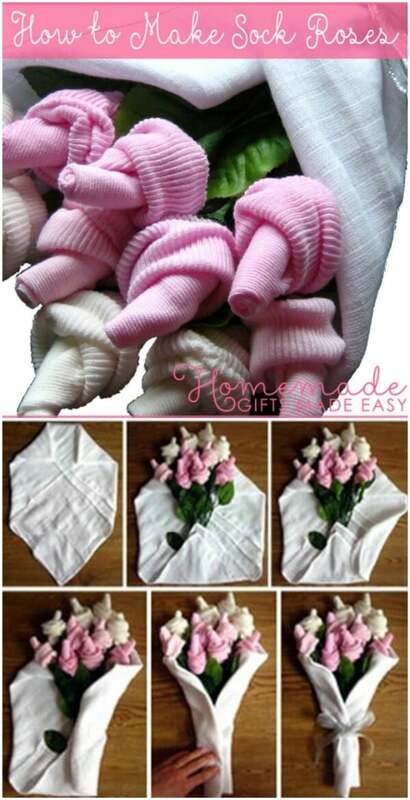 Baby socks are surprisingly easy to shape into roses, which you can then combine into a beautiful bouquet. Visit the source link below for a full tutorial to learn how to do this yourself! This epic diaper cake castle was commissioned to celebrate the upcoming arrival of a little princess in Del Mar, California. You can see right away that it was professionally designed—just look at all the amazing attention to detail. Even the colors are beautifully coordinated! Getting away from the more traditional diaper “cakes,” we have a lot of great designs which don’t look like cakes at all, but follow the same basic principles, one of them being this incredibly realistic choo choo train! The bright colors here look amazing together, and you can be sure this would be a showstopper at any baby shower! Also incredible is this diaper cake in the shape of a tractor. The detail here is outstanding; just look at those cute little fluffy headlights! And of course, someone needs to operate the tractor, and that means an adorable little plush toy! A lot of baby shower gifts really only are useful while the baby is … well, a baby. But babies grow so fast, so it is great to stumble across a baby shower gift idea which can continue to be useful as baby grows up. These personalized storage boxes are an Etsy product, but you could make something similar on your own with some paint and maybe a few printed stencils. These storage boxes are perfect for baby supplies, and as baby grows up, they can be used for toys and more! 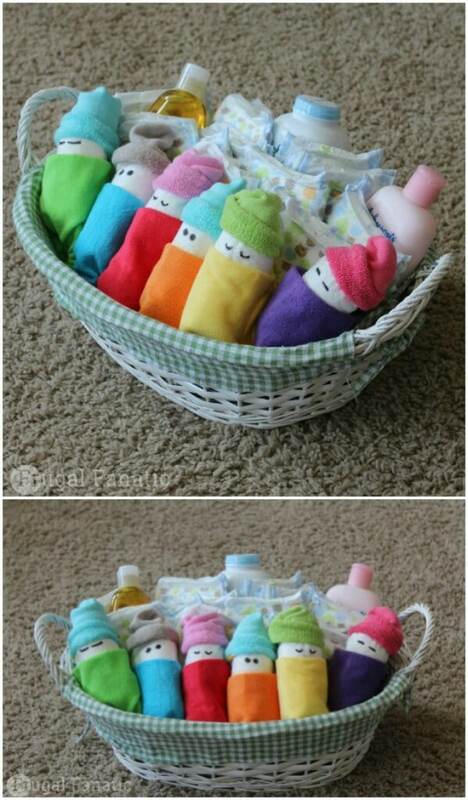 If you are worried that everyone else at the baby shower is going to be bringing in diaper cakes, bouquets and bikes, and you want to make something different, here is a wonderful project to try—adorable little “babies’ made of diapers, baby socks and baby wash cloths! Visit the link below for a full tutorial. While most gifts at a baby shower are for the baby, sometimes there are gifts intended for new moms as well. But don’t forget—these days dads sometimes go to baby showers too! 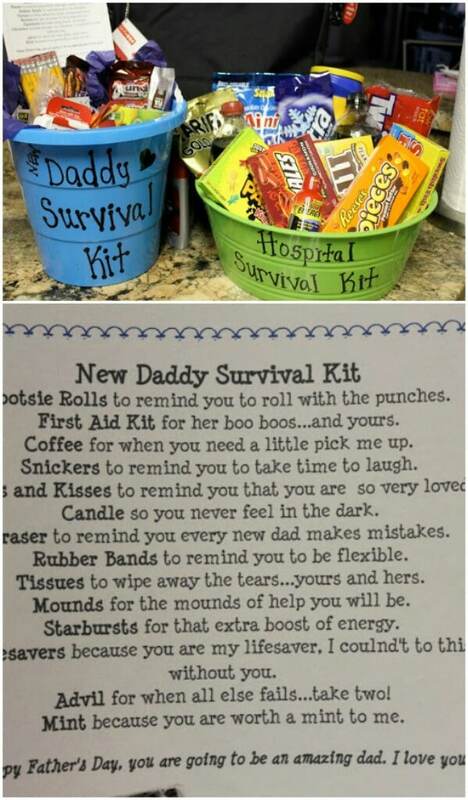 The Daddy Survival Kit was originally planned as a Father’s Day gift for an expecting dad, but it would also make a great idea for a baby shower. And of course you could also gift a Mommy Survival Kit! 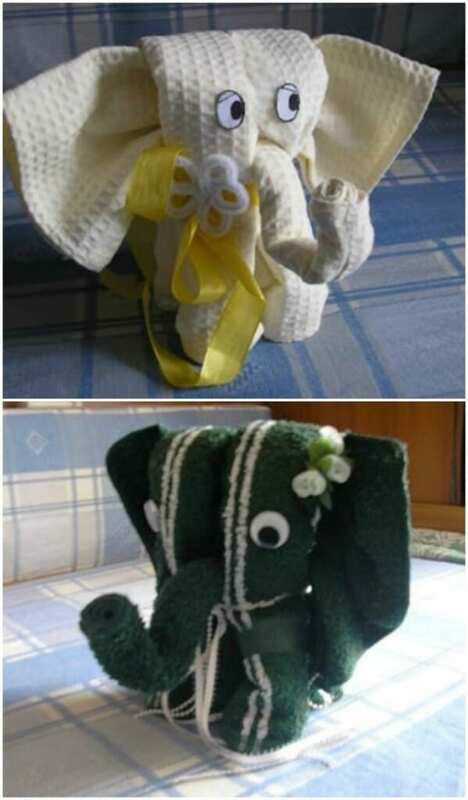 The towel elephant featured in the tutorial link below was received through a gift exchange, but it is an idea I have seen a number of times now for baby showers as well. The tutorial below is detailed and easy to follow; check it out and enjoy making this adorable craft! This is the same basic idea as above, but instead of using a washcloth, you will be using a swaddle blanket. Of course, the only possible drawback with these cute elephant gifts is that they might be too adorable to pull apart and use! Speaking of elephants, here is another idea—a motorcycle diaper cake with a cute plush elephant sitting on top! 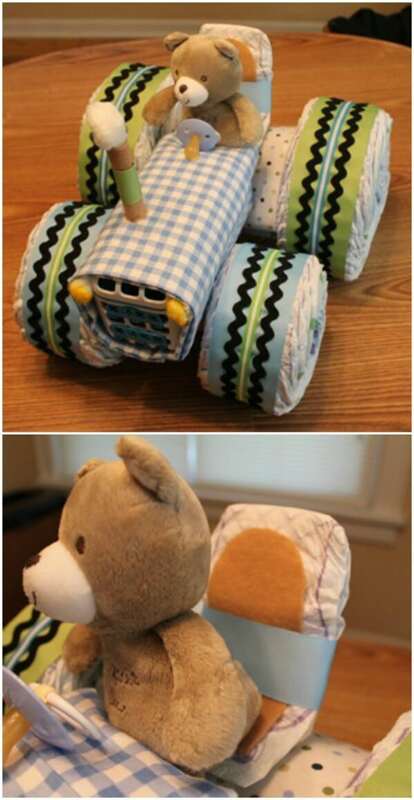 The motorcycle looks incredible, and this idea has an additional benefit over the two above—since the elephant is a soft toy instead of a towel or blanket creation, baby gets to keep it! 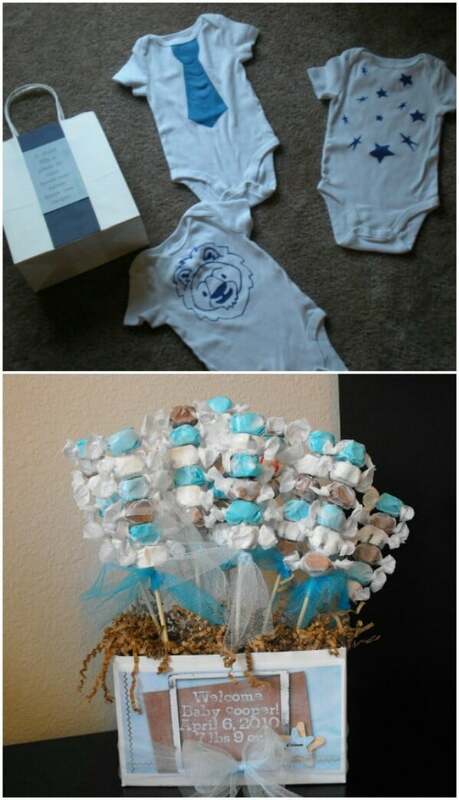 Out of all of these baby shower gift ideas, this might be the one that blows me away the most as far as creativity goes. For sushi-loving parents, this gift goes double: baby gets washcloths, hair bows, socks, clothes, and a fish toy. Mommy and Daddy get a sushi serving platter and a new set of chopsticks. The sushi rolls look scrumptious, don’t they? Here is another awesome video by the same clever YouTuber who made the choo choo train. This one teaches you how you can make an airplane instead—perfect for any little aviator! Next time you are invited to a baby shower, you won’t be stuck with just another boring baby shower gift! Even if you are bringing the same assortment of socks, diapers and washcloths as the next guest, you can present yours as an adorable choo choo train, airplane, motorcycle, or sushi platter, and watch as everyone around you goes, “Awwww!” in amazement! A really cute baby site!